This is the first in the Winter Indoor Rowing series. Check out the second post for specific workouts for weight loss: This Expert Rower Circuit Workout Will Help You Lose Weight. Have you considered purchasing an indoor rowing machine? Rowing machines have recently become enormously popular. Rowers offer a low impact workout that is great for all levels of training. And even for those who may be experiencing knee or foot issues. Experienced athletes also know that rowing workouts can be intense. You can target the core and upper body in a way that no other piece of home exercise equipment can offer. What kind of people own rowers? Athletes who choose indoor rowing are frequently also involved in other athletic activities. Oftentimes, they are looking for a quality cardio workout that will not add impact to the knees and feet. Rowing machines are frequently featured in workouts and are growing in popularity in group fitness environments. While indoor rowing is a no impact form of exercise, it can be a highly demanding cardio exercise and develops upper body and core strength. Rowing complements lower body dominant outdoor activities, such as cycling and running. Over time, the additional core and upper body endurance gained by regular rowing workouts will improve performance in these activities. Despite the tremendous athletic benefits, rowing also offers a natural workout that is approachable for nearly all exercisers. The seated position takes pressure off of the knees and feet and engages the core and shoulders. Rowing is also popular with larger athletes due to the lack of impact. It also naturally adapts to the users’ strength by using body weight to add to the movement. Rowing is useful in building and maintaining fitness over the winter. It helps to step up spring training for outdoor cyclists, swimmers, and runners. Their compact size, portability, adaptability, and impact on overall conditioning. This makes rowing machines one of the greatest powerhouses of home fitness equipment. 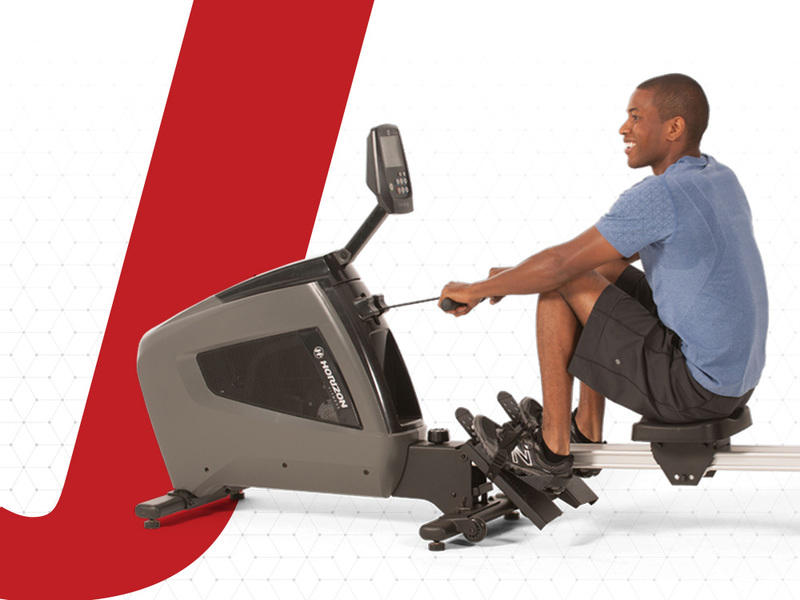 What are the benefits of a rower over other cardio machines for the home? By specifically targeting the upper body and core, rowing complements other forms of cardiovascular exercise in a way that is not offered by any other piece of exercise equipment. From the comfort of a seated position, you control the resistance and pace in order to modify the intensity of the workout. The simplicity of this movement and no impact nature of indoor rowing makes this an appealing workout for all levels of athletes. Rowing works well as an independent program to build strength and cardiovascular endurance. You can also integrate it with other forms of training to provide complementary active recovery, improved power, and increased endurance. Rowing machines are also very compact and portable. You need to worry about finding a power outlet or mess around with cords! Many models also fold up to a very compact size when not in use, saving valuable floor space. For new athletes or those recovering from injury, rowers offer a very safe and comfortable ride in a natural seated position. Getting on and off of a rowing machine is very simple and the adjustment required is minimal. You simply adjust the resistance and position of the foot pad and are ready to row. What other kinds of features do indoor rowing machines have to offer? While rowing machines have been around for decades, many today offer a few extras that can add to the enjoyment of your workout. You can control the resistance through manual settings or find a responsive design that adjusts resistance according to your speed and effort level. This provides a more natural movement that is approachable for all levels of athletes. Integrated consoles can provide feedback throughout the workout. They can include fun options, such as racing or interval workouts. Some consoles will also integrate with heart rate monitors in order to provide immediate feedback regarding your effort level. Many consoles also offer effective, pre-programmed workouts that keep your sessions in line with your training goals, whether that’s active recovery or calorie blasting. Next up, read: This Expert Rower Circuit Workout Will Help You Lose Weight. About the writer: Joli Guenther is a certified personal trainer, yoga instructor and clinical social worker practicing in and around Madison, Wisconsin.